William Phaler from azdvs.gov and veteran Ignacio Reyes. You can have the best program or service in the world but if no one knows anything about it—what good is it? 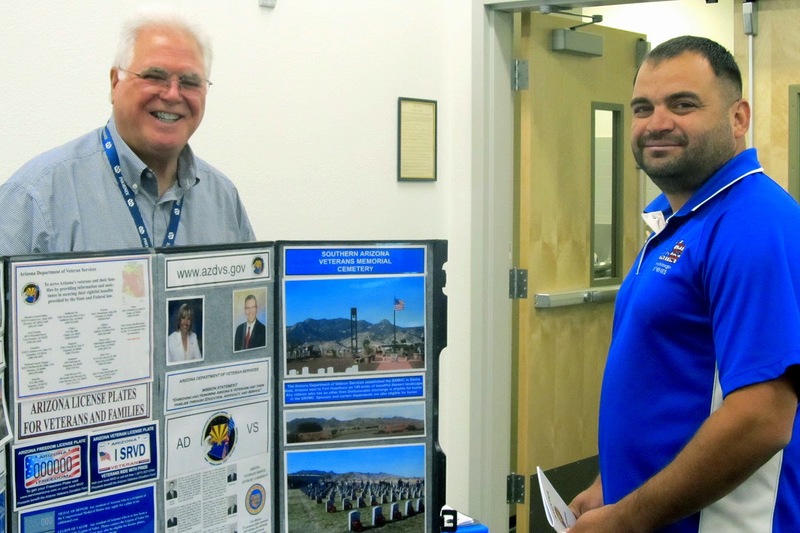 Increasing awareness about the benefits available to veterans was the primary focus of the Veterans Healthcare Benefits and Resources Clinic at Rio Salado College Southern in Tempe on Friday, Oct. 17. “After listening to veterans in our district, we found that many were unaware or did not have access to all available community resources,” said Congresswoman Kyrsten Sinema, who hosted the clinic with Tempe Mayor Mark Mitchell, Councilmembers Robin Arredondo-Savage and Corey Woods, the Phoenix VA, Maricopa Integrated Health System (MIHS) and the East Valley Veterans Education Center (EVVEC). More than 30 organizations and VA benefits eligibility advisers offered one-on-one advisement, information on medical care and Medicaid, and how to find help with grief, military sexual trauma, Post-Traumatic Stress Disorder and other issues affecting veterans. The clinic was also an opportunity for the EVVEC to increase awareness about the comprehensive services it offers to veterans and their families-- all year long. EVVEC Service providers are available to veterans all year long. The center also provides skill assessments, financial aid and college orientation services to help veterans use their Post-9/11 benefits by mapping out an education plan that fits their unique needs and goals. It hosts Arizona State University’s Veterans Upward Bound classes, which help students improve developmental English, math and computer skills and transition into college. It is also an access point for Maricopa and Phoenix Workforce Development and has a comprehensive referral service program that includes many community-based agencies that can provide assistance with employment, health and housing services. There are monthly workshops, which include help with resume preparation, interviewing skills, financial literacy, and VA benefits; free wireless Internet and computer access; help learning how to use computers and private Skype access for family of deployed service members. Rio Salado College Southern is located right next door, so veterans and their families have additional access to Adult Basic Education, Adult Secondary Education, English Language Acquisition classes, workshops, testing services and more. The EVVEC began providing services in 2010 from a temporary location on Broadway and Southern. This new facility, which opened its doors in February 2014 serves as a permanent home for the center, which is hosted by Rio Salado College in partnership with the Maricopa Community Colleges District, Scottsdale, Mesa, Gateway, Chandler-Gilbert and South Mountain Community Colleges. Other partners include the Arizona Department of Labor, Arizona Department of Veterans’ Services, Disabled American Veterans, Arizona Department of Economic Security, Phoenix VA Healthcare System and the Phoenix VA Regional Office. For more details about services, hours of operation and to schedule a tour of the EVVEC, visit www.evvec.org or call 480-384-9850. EVVEC Service Providers pictured above: Jeannette Breden, ASU Veterans Upward Bound Program Coordinator; Troy Friedman EVVEC Site Coordinator; Kara Cutler, NAU Military Program Coordinator; David Lopez, Maricopa Workforce Connections Trainer. 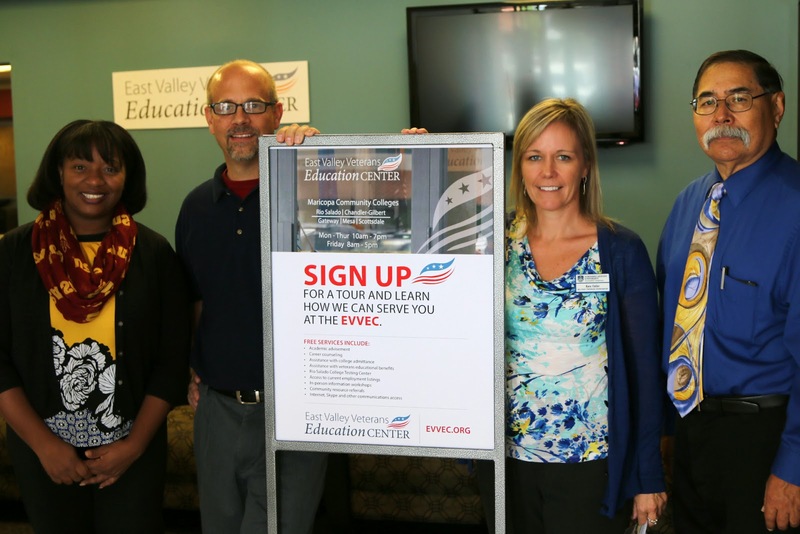 They were among the service providers available during the Oct. 17 Veterans Healthcare, Benefits and Resources Clinic at Rio Salado College Southern in Tempe and offer help to veterans and their families all year long at the EVVEC. This story can also be found in the October 25, 2014 issues of the Tempe Republic. By Annette Flores, manager of Rio Salado College media relations.